Medicine based on natural ingediënts - Selectkoi - Your online koi and pondspecialist ! 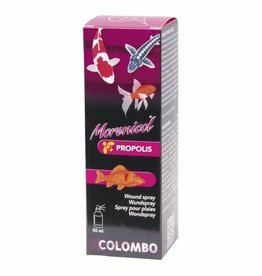 Colombo Morenicol Propolis 50 Ml. Wound Spray for wound treatment with koi. Is a unique natural parasietverdrijvende treatment effective against skin flukes (Gyrodactylus), gill (Dactylogyrus), white dot, dot pepper (Oodinium), Costia (Ichtyobodo necator), Chilodonella and Trichodina.